Going to Ron Howard’s Rush for subtlety is about the same as heading to a Formula One pit stop in search of contemplative silence. Working from a screenplay by Peter Morgan, Howard takes a no-nonsense approach to race-car competition, focusing on the two things Formula One drivers might emphasize themselves: intoxicating applications of speed and big-time expressions of attitude. 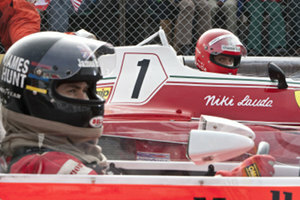 Howard builds his story around the rivalry between real-life drivers James Hunt (Chris Hemsworth) and Niki Lauda (Daniel Bruhl), top competitors who made a major impact on their sport during the landmark 1976 season. Hunt liked to defy death, party hard and take risks. Although he was hardly risk averse, Lauda was the more calculating of the two. Decidely less handsome than his counterpart, Lauda was known as “Rat” because his overbite supposedly made him look rat-faced. The two men disliked each other at the outset, but over time developed a grudging mutual respect, based on an appreciation of the other’s skills. For both Hunt and Lauda, driving seems less a sport than an obsession, an activity they had to pursue — even if it meant, in Lauda’s case, paying his way into the sport, something that earned the scorn of other drivers, at least at the beginning of his career. As played by Bruhl, Lauda isn’t an easy man to like, but the views of others don’t much faze him: He doesn’t seem to care what people think about him. When the story shifts away from the world of racing, it’s mostly to focus on relationships between Hunt and Lauda and their wives, played respectively by Olivia Wilde and Alesandra Maria Lara. But Howard is less interested in personal relationships than in fulfilling racing-genre demands. Cinematographer Anthony Dod Mantle joins with Howard in an application of technique designed to put us in the driver’s seat, to allow us to experience — in vicarious safety, of course — the thrill of high-speed driving. There’s some talk of the methodical way Lauda went about preparing his cars and a harrowing look at the accident that put Lauda in the hospital, perhaps because Hunt insisted on racing on a wet track at Nürburgring, the German Grand Prix. Lauda had lobbied for the race’s cancellation because of weather. Hunt, who was chasing Lauda in the standings for the Formula One championship, took the opposite view. According to the movie, Hunt blamed himself for the accident that almost killed Lauda and left him disfigured. If you’re schooled in the differences between Ferraris and McClarens, you’ll probably get even more out of Rush, but be assured: Howard hasn’t made a movie only for racing aficionados or wannabes. He’s made a general-audience slice of entertainment that seldom spills the oil of complexity on its sleek, mobile surfaces.